A solid design solution shouldn’t start as a single concept; rather, it should begin its iterative life as an unruly, overflowing collection of multiple ideas in response to a problem. This divergence of thinking is an essential ability for any designer, developer, or maker to maintain, as it ensures all possibilities are thoroughly considered before converging on and committing to a final outcome. Sketching—with plain old pen and paper—possesses the potential to increase anyone’s ability to think and design divergently: as an inherently expressive medium, it frees the mind to think outside of the box (or screen) and loosens one’s inhibitions. 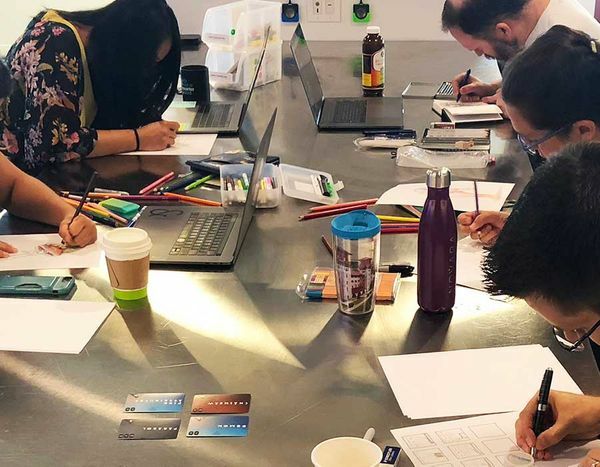 It’s also accessible to anyone in nearly any situation, which makes sketching the perfect skill to hone for both experienced designers and those looking to explore the field of design for the first time. Nonetheless, sketching can sometimes seem intimidating rather than inspiring. If you’re someone who ends up gripping your pen with white-knuckles and staring at your blank page in anguish every time you attempt to sketch—or if you’ve simply gotten out of the drawing habit, or are curious how sketching can augment your design process—this workshop is for you! We’ll cover the details of drawing as it relates to divergent thinking, explore examples of process sketches across the field of design, and of course we’ll do some sketching of our own, too. You’ll leave with tangible exercises to increase your comfort with this medium, as well as a rejuvenated sense of confidence in your ability to generate and communicate concepts with nothing but pen and paper. Lia Prins is an information designer with an unflagging affection for science com­mu­ni­ca­tion and learning, and in some circles is considered to be quite the drawing utensil connoisseur. She’s passionate about using visuals of all kinds—data vis, illustrations, napkin sketches—to make complex concepts like science and technology more approachable and understandable for the public. Greg King is a product designer from Raleigh, NC currently based in Austin, TX. As the son of the world's greatest art teacher, the value of sketching has been impressed upon him from a young age. He is a champion of the adage “anyone can draw”— what he lacks in skill he makes up for in courage. José Paez is a User Research and lead facilitator on IBM’s Power Systems Design team. When not working in the realm of enterprise AI, José spends his time illustrating and painting whatever crosses his mind. Illustrating with his markers is where José feels most at home but his real passion is abstracting his creative skillset into applicable forms for his research methodology. Ramiro Galan is a Visual and UX designer with IBM Watson Health. He's had the privilege to work with many talented teams in a very diverse range of projects. His work covers a broad basis of genres like games, life sciences, and sports.